Flying implies a distinctive media experiences. Passengers on board are craving for entertainment, but aviation limits just how it can be delivered. We offer two main in-flight lines, one service for devices connected to the internet and the other for flights with no internet access. These services are also available for other types of passenger transport such as trains (in-train entertainment), cruise ships (in-cruise entertainment), public transport and private cars (in-car entertainment). We offer a range of services to airlines with internet access and in-flight wireless providers, including news, sport, practical tips, travel guides and multimedia enhancements. We have taken full advantage of our proven technical know-how in size adjustment (automatic adaptation of images, frequency of delivery), metadata and XML formatting. Our content is available in several languages. We also provide precise filtering by keyword, region or theme to enable the airline to deliver a rich variety of news in a constrained environment, subject to local pressures. 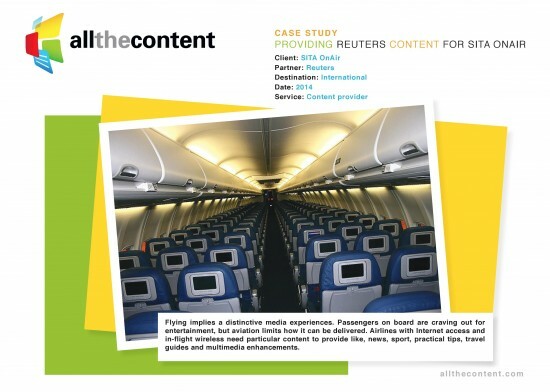 AllTheContent has a presence in more than 30 companies around the world. We can set up a stream of content that can be used in newsfeed or service portals. Our system of real-time online portal mixes news, texts and video. The content comes live from the ground to supply your plane. We assure high-quality content based and we work with various partners, such as Reuters. We can develop a range of interactive products for your needs that have not yet been produced or marketed by other companies. We can offer tablet animations, with the possibility of observing the overflown landscape, as seen through the floor of the aircraft. Our team can also provide enriched or geolocalised news. When Internet access is finally available for all devices, experts predict the gradual phasing out of onboard screens and their replacement by internet access from passengers’ own mobile phones or tablets. At present, most content consumed in-flight is delivered off-line, through the aircraft’s internal VOD system. To meet this particular need, we can supply video programmes of varying lengths, and interactive applications. Our contents – either with no speaking or in English or French – can all be localised in a local language and adapted to your specific needs. We can supply contents with no speaking such as SD or HD ambience videos to let passengers settle down and unwind in front of spectacular sights and Zen music. We also have an extensive catalogue of adventure and extreme sports films shot in some of the most beautiful places on the planet. Passengers are sure to enjoy our catalogue of tourist information videos, lasting 3 to 5 minutes, subtitled or dubbed into their own language, and also our languages courses, which give a taster of the language which can only be useful on arrival. Finally, we offer interactive wellness applications which combine animation, short video clips and texts. They include exercises to help passengers relax and enhance their comfort (by preventing headaches, backache…) during the flight. A search facility allows them to find the right exercise to address their particular discomfort. The contents have licenses of varying durations (2, 3, 6, 12 and 24 months), with unlimited use during this period. Delivery methods and formats are flexible. The contents can be sold directly to the airlines, to their in-flight entertainment agency and to independent distributors. We can provide on-demand VoD licenses. Videos can be viewed In-flight. You can create a memorable flight experience by providing your clients with an In-flight magazine. Through this magazine, you can highlight your company and quality service in a discreet and professional way. You can use this effective tool and provide relevant content chosen according to your target audience. The magazine can be a print or digital version, depending on your preferences. Reading is one of the most popular flight past time. We can provide you with the appropriate licenses for ebooks. This service will be set up and your passengers will be able to directly download ebooks during their flight. Click on the image to read the case study.